Rakuya, a Japanese fusion omakase and sake joint, is the new kid on the Katong block. In a sea of cafes and restaurants that line East Coast Road, it stands out with its shimmery gold-painted door frame and an eye-catching signboard with the kanji character for "raku" (it means "fun) lighting up in bold red as night falls. Its Asian-influenced omakase menu offers items such as Mapo Chawanmushi and Fried Prawn Head with Sambal Mayo. The omakase set menu ($48++ to $128++) comprises an amuse bouche, an appetiser, a cold dish, a hot item, a hot dish, a main, rice or noodles, a soup and dessert. Among the signature dishes is the Foie Gras Chawanmushi with mapo sauce, where pan-seared foie gras and freshly made chawanmushi is topped with housemade mapo sauce. This item features in all the omakase menus. Other signature dishes are the Bak Kut Teh Udon - Inaniwa udon with housemade pork broth, paired with tender baby back ribs - and Yuzu Kaya Toast, a caramelised butter toast served with housemade yuzu-infused kaya spread and served as a dessert in the omakase menus. The restaurant also serves set lunches and a la carte plates, done omakase-style as well, with fried items ($16++ regular/$22++ premium), meat items ($16++/$22++), sashimi ($24++/$32++) and dessert ($9++). The sake bar has a selection of sakes, including seasonal ones, from various regions in Japan. You can become a sake member by spending $300 in a single receipt - members enjoy 15 per cent off all sakes and 20 per cent during their birthday month. En Sushi, a contemporary Japanese restaurant situated beside Rendezvous Hotel, features an extensive menu of sushi, sashimi, donburi, maki, handrolls and yaki (grill). With more than two decades of experience in Japanese cuisine under his belt, chef Kenneth Tan crafts each dish to bring out the best flavours of Japanese food. Thanks to years of friendship with food suppliers in Japan, co-owner Kenneth Koh brings in fresh ingredients at prices that make dining at the 70-seater En Sushi easy on the wallet. Among the menu highlights is Bara Chirashi Don ($10.80++), a generous bowl of fresh-cut sashimi chunks such as salmon, tuna, yellowtail and octopus marinated in En Sushi's signature soy and piled atop premium sushi rice. 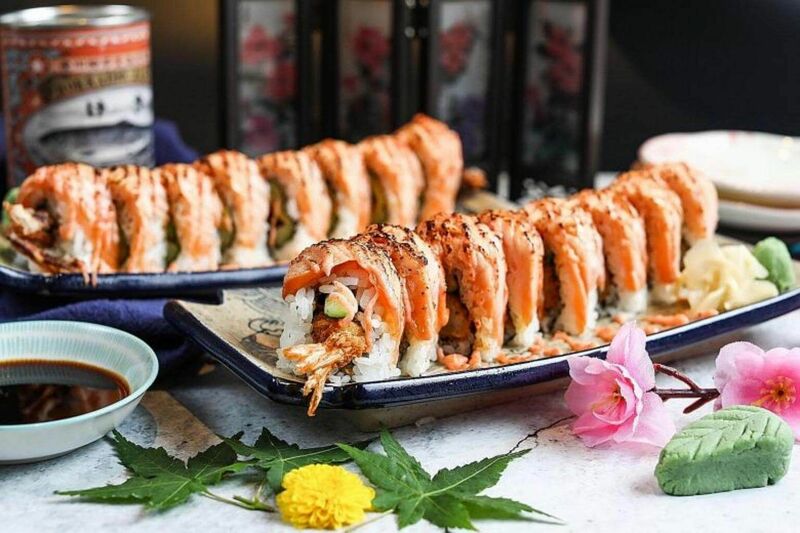 The Spicy Ebi Fry Salmon Aburi Maki ($15.90++) comprises tempura prawn deep-fried in a spicy batter, rolled in sushi rice, layered with smoky-torched salmon slices, and topped with mentaiko sauce. In the Sliced Beef Steak ($14.90++, 100g), you get marbled Meltique Beef slices grilled to a consistent tenderness. For beverages, the restaurant's special, En Beer ($7++), is a refreshing clash of creamy bold Sapporo Premium Black Beer and golden crisp Sapporo Premium Beer. At River Wok, you will find an eclectic menu created by executive chef Kantha Chookiat, focusing on cuisines from countries such as Laos, Indonesia, Thailand and Vietnam. The chef grew up in Chiang Mai, Thailand, where he became familiar with the herbs and spices of Indochina. He has more than 30 years of culinary experience. Start your meal at the 150-seaterrestaurant with a traditional Thai salad, Yam Tuapoo Goong Sod ($16++), consisting of wing beans, tiger prawns and shredded chicken. Follow up with Nam Khao Hor ($10++ to $14++), a Vietnamese hand-rolled rice paper with minced chicken and roasted rice crumbles; or the Thit Bo Luc Lac ($26++), a Vietnamese-style shaking pepper beef platter. 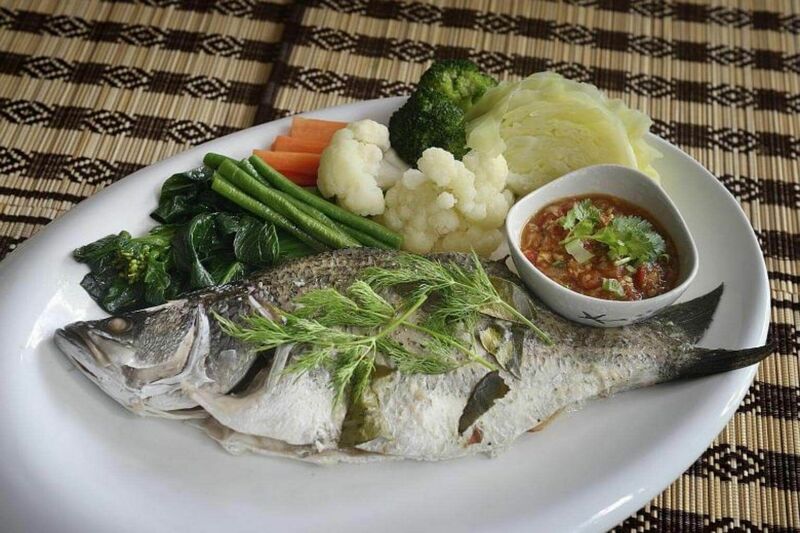 The Gaeng Phed Ped Yang ($22++), a roasted duck in rich Thai red curry, is given a creative twist with grapes and pineapple; while the Pa Heung Jeow Mak Len ($38++) is a simple dish consisting of a whole steamed sea bass, with Laotian tomato dip and a side of fresh vegetables. One of River Wok's bestsellers is the traditional Indonesian Ayam Buah Keluak ($24++), with just the right hint of nuttiness paired with the spiciness of the gravy. For dessert, choose from the Banh Chuoi ($12++), a Vietnamese dessert of banana fritters and black sesame ice cream; or the traditional Thai Khao Neow Ma Muang ($10++), a sweet sticky rice pudding with mango and coconut cream.